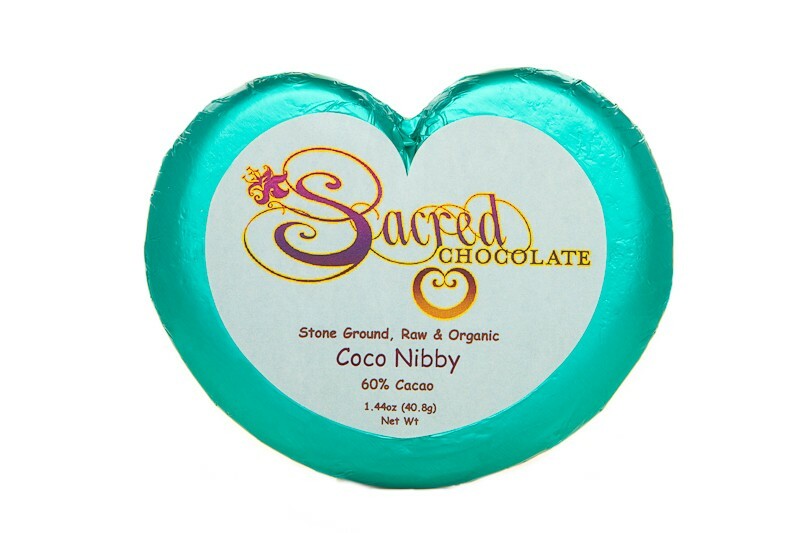 Sacred Chocolate's Organic Coco Nibby raw chocolate heart bar includes whole cacao nibs and coconut flakes. It is crunchy! It reminds one of the old Rocky Road, Almond Joy or Mounds chocolate candy bars of yesteryear. This chocolate is sweet & creamy. 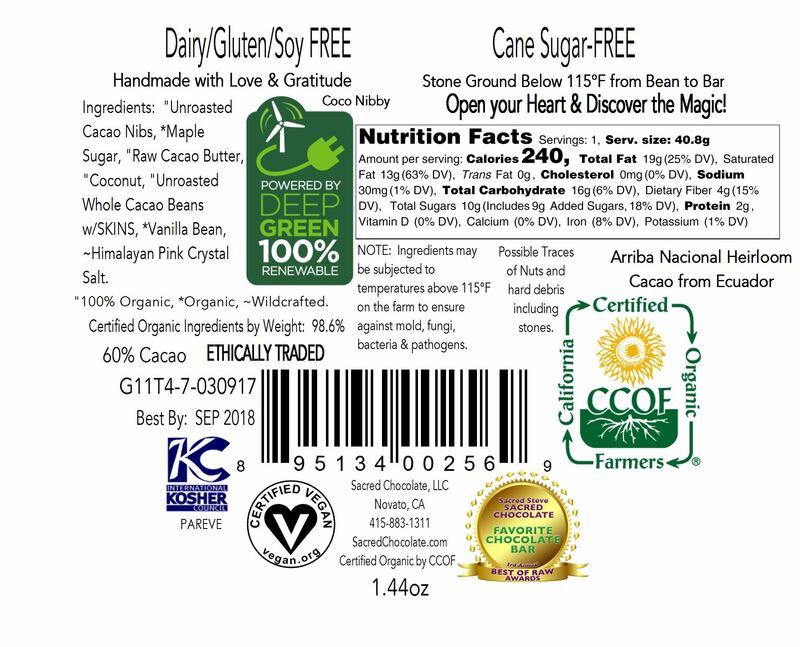 Coco Nibby has a 60% Cacao Content, and includes the skin/husk of the cacao bean for superior nutrition! Sacred Chocolate's Coco Nibby is slowly stone ground under 115 degrees Fahrenheit from bean to bar right in our custom chocolate factory in Marin County, California, which was designed from the ground up to make raw chocolate. Each 1.44oz bar comes in the shape of a perfect golden spiral heart, symbolic of the fact that raw cacao is so good for the heart. 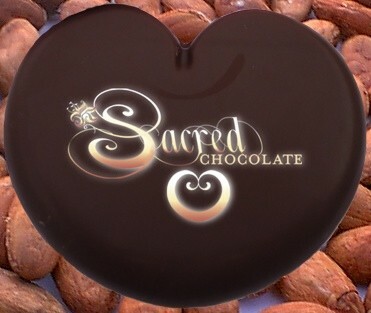 This delicious Sacred Heart chocolate bar is hand poured & hand wrapped. All Sacred Chocolate is prayed over by Sacred Steve, the Sacred Chocolate Oompa Loompas and others in order to elevate the vibration of the chocolate. "Unroasted Cacao Nibs, *Maple Sugar, "Coconut, "Raw Cacao Butter, "Unroasted Whole Cacao Beans with SKINS, *Vanilla Bean, ~Himalayan Pink Crystal Salt. Certified Organic Ingredients by Weight: 98.6%. Produced in a Facility that also Processes Nuts. Contains Coconut. WARNING: May include hard debris including stones. Manufactured from Bean to Bar using 100% Eco-Friendly Renewable Energy. Cacao Source: Heirloom Arriba Nacional, Ecuador. "Forget love, I'd rather fall in chocolate"
Discover Theobroma Cacao / Chocolate's properties that effect our feelings of love & compassion.Chocolate has many elements that relax us and release chemicals in our bodies that allow us feel more love, peace and joy.